A few weeks ago when iOS 7 came out, a fake ad made the rounds on the web saying that iOS 7 would magically make your phone waterproof and unfortunately, some people actually believed this. Magic aside, some people want and need a waterproof iPhone and Apple recently added water protection to AppleCare+. A compelling argument can be made to purchase the protection; these devices go with us everywhere including places where liquid spills occur. An alternative to Applecare is to get an everyday case that can withstand water and other mishaps, and that’s where I put my money. The market in waterproof cases has grown considerably with numerous new entries since I first reviewed the field so let’s jump in. If all you are looking for is basic liquid protection without many other features, Outdoor Tech’s SAFE Waterproof iPhone case ($49.95) delivers basic protection in a case that is easy to install. Sound quality for regular calls and the speaker phone is excellent, and the case offers easy access to volume controls. Access to the headphone jack and mute switch are difficult so as an everyday case this might not be a best choice, but an excellent case for bringing your phone into water friendly environments. Poolside Tweets, anyone? For a step up from basic water protection, Griffin’s Survivor + Catalyst ($69.95) provides not just waterproof protection but drop resistance up to 6.5 feet along with access to all controls, including the heaphone jack. The case, which includes a convenient lanyard, provides a slight bit of bulk and I did notice a small reduction in sound quality on call. For a bit more money, the Balistic Hydra ($79.95) offers shock protection to 8 feet as well as a handy belt clip for users who prefer those type of cases. Access to all controls was easy and the case caused no discernible difference in telephone sound quality. 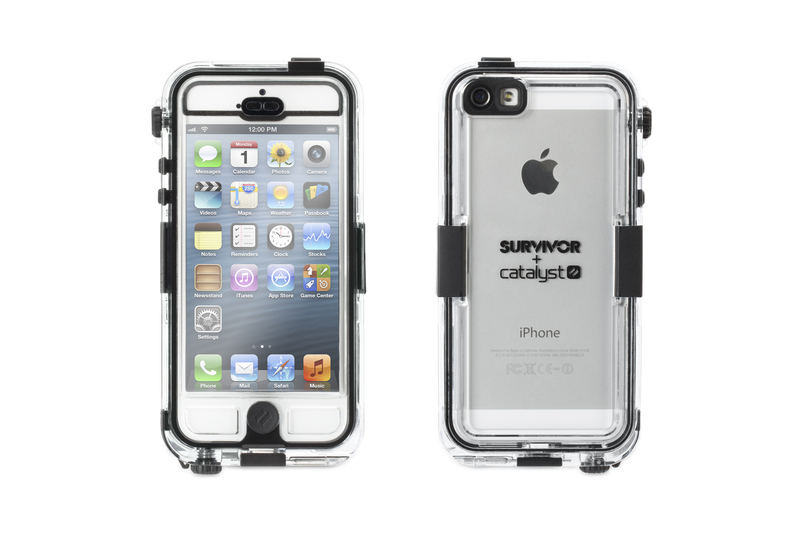 The ultimate in shock protection and waterproofing in an iPhone case is the Otterbox Armor. For $99.95, this heavyweight case provides shock protection to 10 feet and of all the cases I tested was the easiest to insert and remove the iPhone, with two heavy metal latches that lock and unlock the case and sealed flaps providing protection the headphone and charging ports. Sound quality was impacted when the flaps were on, but they can easily be disengaged during a call. If sleek and svelte is your goal and you want the absolute thinnest case for your iPhone that provides waterproofing, the Lifeproof Nuud ($89.99) is the way to go. Waterproofing is provided without using a screen protector and it provides drop resistance to 6.5 feet, making sure you can use the maximum sensitivity of your screen (great for games). 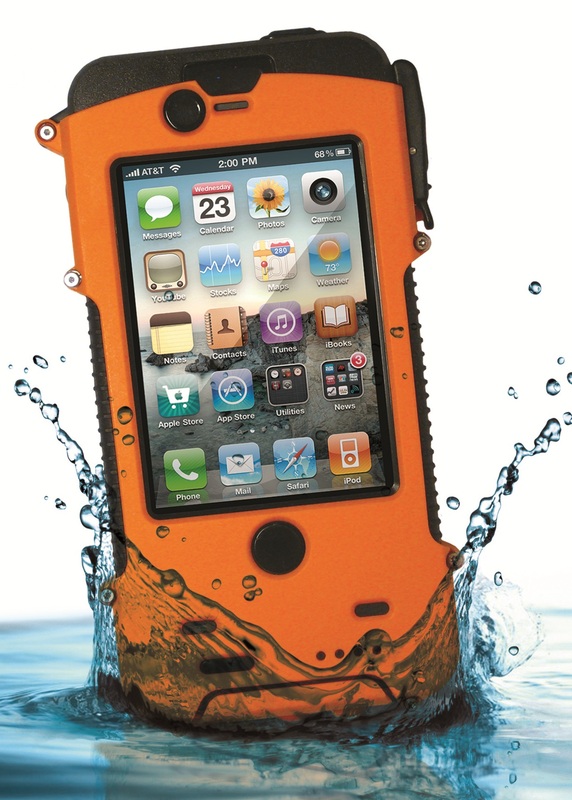 Lifeproof offers a series of accessories for specialized use such as on a boat or on a bike. They also offer the Nuud for the iPad 2/3/4, which I tested and it worked great. Both devices require a special adapter to use the headphone port (included). If you are looking for specialized waterproof and shock resistant cases for biking, Wahoo PROTKT($69.99) is designed for mounting on your bike. 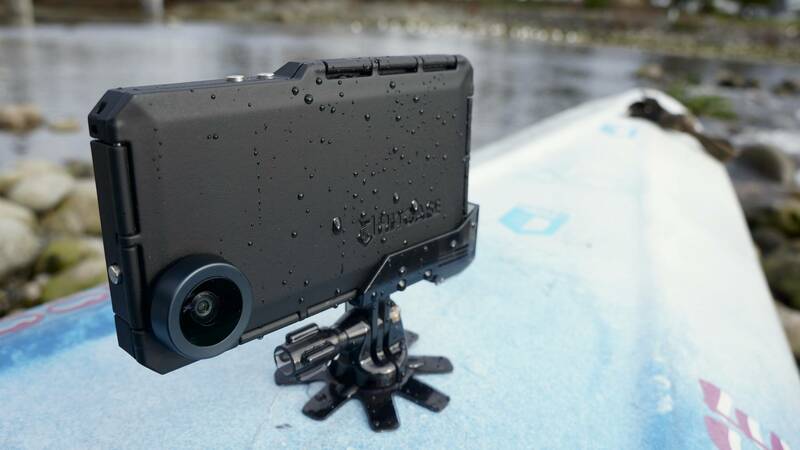 And the Hitcase ($129.99) iPhone 5 case can not only can be mounted on a bike but includes an integrated wide angle lens for photography and accessories for mounting to a hat or chest strap (videographers rejoice). Both cases were bulky and blocked access to most of the controls. I noticed a significant reduction in call sound quality while using these and they are best used with Bluetooth headphones. This may not be a major issue; if the phone is mounted on your bike, you probably don’t need access to these controls. Finally, if you want waterproof shock protection and extended battery life, iBatzz has the Mojo Refuel Aqua ($119.95) which has a replaceable 2200mAh battery and the Snow Lizard SLXTREME (not yet available for the iPhone 5) ($129.95) which has a non-replaceable 2000 mAh battery and also includes a solar charger. The SLXTREME does not allow access to the headphone jack and the Mojo requires an adapter similar to the Lifeproof for the headphone jack. Both these cases noticeably reduced call audio quality, especially while using speaker phone. 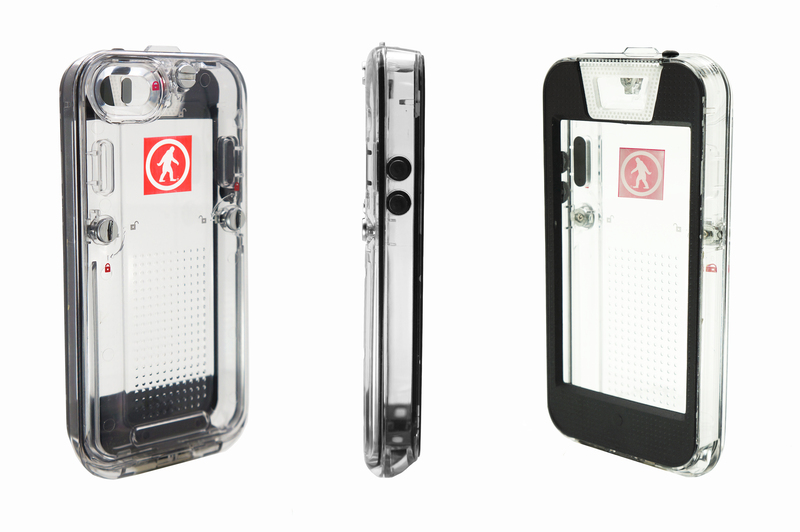 The manufacturers of all these waterproof cases recommend you test them to make sure they are waterproof before you put your phone in the case, as well as check periodically. Sometimes I realized I put a case together slightly wrong and once I corrected this, waterproofing was fine. Also if you drop or notice damage to the case, the manufacturers suggest retesting. None of the manufacturers accept responsibility for water damage, but Lifeproof will allow you to buy optional waterproofing warranty. None of the tested cases currently work with the iPhone 5S fingerprint sensor. All these cases will give you excellent protection against the dropped phone in the toilet or pool (untested by me) or a spilled drink (tested by accident). For the same amount of money as AppleCare you avoid the hassle of a trip to the Apple store for a replacement. With a great variety of cases — from sleek and svelte right up to extreme sporting — you’ve got lots of options available in this growing market. Depending on where you live, Apple Care could be a lot more convenient than Lifeproof’s optional water coverage. My iPhone 4s went for a swim in my friend’s pool in my once-beloved and well-touted Lifeproof case, but the case failed. Possibly my fault because I hadn’t tested it in months, but I had it in the shower regularly with no problems, so I didn’t think about it. Anyway, when I called Lifeproof (expecting support from a time long before their recently-added “water protection” policy), I was told about this new policy, only to find I was now S.O.L. (I’m certain they used to just promise to replace your phone…but of course I can’t find any proof of this anywhere) So … They did offer to replace my case, only to reneg even on that later. Anyway, had I even had their water protection policy, I would have had to mail them my iPhone, wait to see if it could be repaired or something, then maybe get it back … Instead, I went to one of oh, I don’t know, 5 or 6 Apple Stores within 2-3 miles of me, waited 10 minutes, and got a brand new replacement one for $50. What would I have done for a week or more while I waited for Lifeproof to work on my wet phone? I don’t recall being told about getting a replacement overnighted to me… it’s not like they have phones in stock there. Why should they? Are there cases failing all the time? So I’m waiting for the latest updated waterproof cases for the 5s. And to get a new 5s. And I won’t be getting a Lifeproof. They broke my heart. You Guys left out the iClam by Fujita Xtreme for the iPhone and Galaxy S is perfect for surfing and MTB, the cool thing is that it comes in a package with different mounting kits, so is ready out of the box. Thanks for pointing that out, it’s fixed. Perfect, thanks again for your help on correcting that!